German Shepherds from proven bloodlines. Power and intelligence for work, faithful family companions and protectors.... All in one package .... It's our passion, promise and Guarantee. Thank you for visiting! The name "von Kalt Bach" originates from my business Cold Creek Dog Training, and means Cold Creek in German. 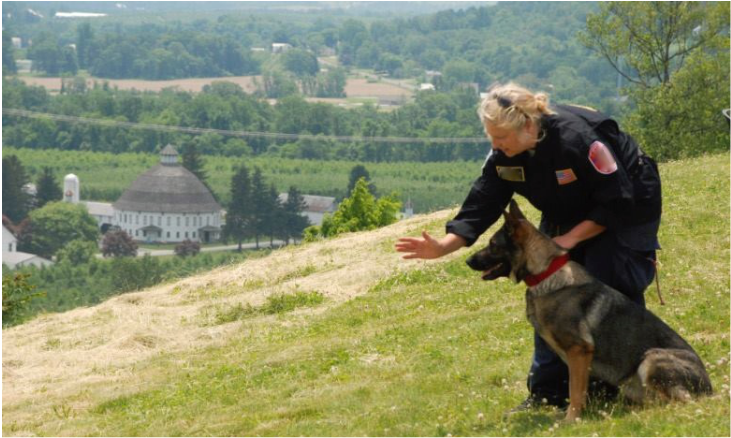 I've been involved with the working German Shepherd breed for over 30 years as a family dog owner and competitor in many venues of AKC obedience to Schutzhund. I'm also a volunteer Search and Rescue K9 Handler, and professional FEMA Urban Search and Rescue Canine Search Specialist for over 20 years. I have loved the German Shepherd in all these capacities. But most importantly I'm someone who who really respects what the breed is still supposed be........a truly wonderful dog with unlimited versatility in any venue of work or a wonderful dependable family companion and protector. The term "working German Shepherd" is sometimes misunderstood. The titled background of the GSD proves temperament, reliability and performance in a given field. It does not mean that your dog "has" to have a job and be busy 24/7. Even most working dogs are not busy all day, they should have an "off switch" and be able to relax in "down time" but all dogs require consistent motivational training with good everyday leadership skills. At best, a GSD puppy should be confident and outgoing and have proof of parentage that is CLEAR of the Disease Degenerative Myelopathy (DM is a fatal disease), hips and elbows verified by OFA or comparable foreign registry and eyes certified. Parent and pedigree should also have some type of accomplishments or achievements (titles) in life. These accomplishments are crucial to preserving the solid temperament of the breed and are as important as health testing. Also a puppy or dog should come with a guarantee for health and hopefully temperament too. If you are considering a German Shepherd you will already know there are many different styles; from "sloping show dogs" to "straight backed" dogs, huge dogs over 100lbs to smaller dogs.... and so on. Temperament should always be first and foremost in considering a GSD. A badly bred German Shepherd can be one of the most challenging dogs to own because of its natural defensive drive. A good German Shepherd has a balanced blend of prey, defensive and pack drives. Myself and many others will recommend to stay away from pet store puppies, "Amish" dogs, and backyard breeders and American bred AKC show dog styles with severe angulation. They should not be "giant" or "sharp- snappy" dogs, they should work willingly with their owner and not challenge them. A German Shepherd with great temperament and health can not be surpassed. Once you own one; you will not want anything else! The money you save on a "cheap" puppy store dog or "Lancaster, PA" or back yard breeder who wanted to breed his "nice pet" will be made up in one trip to your veterinarian for health issues and sometimes thousands more! Along with limited breeding once every two years or so, I also help with re-homing rescued German Shepherds. At times I can coordinate a forever home for a dog in need of rescuing or get a dog out of a bad situation. Whether you choose to look at a puppy or dog from my limited breeding program or elsewhere, I encourage you to look at proven lines for temperament and health. Ask many questions and visit lots of places and meet many people who know about the breed. Please feel free to give me a call and I will also be happy to help you with referrals for places to look for a puppy or dog.